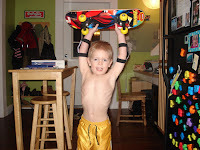 Joshua received a skateboard and knee and elbow pads from a friend of ours for his birthday. 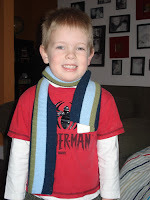 I guess what prompted this decision was he asked himself, "What would my 5 year old son want for his birthday?" 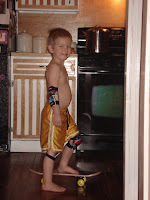 Joshua's been practicing in the kitchen and has already been making plans to ride the skateboard places. My only question was, "Where's the helmet?" Every winter we've been up here we've had a good amount of snow. Not this year...well, not until today. 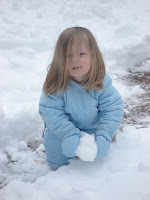 We've had a few snowstorms here and there but we got at least a foot this time! Emma Grace was so excited to go outside that she went and got her clothes and pull-up and brought them downstairs for us to get her dressed. 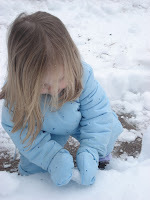 She had lots of fun throwing snow balls onto Daddy's nicely shoveled sidewalk! 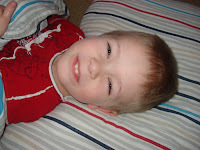 Unfortunately, big brother stayed inside with a fever and sore throat. Poor guy! 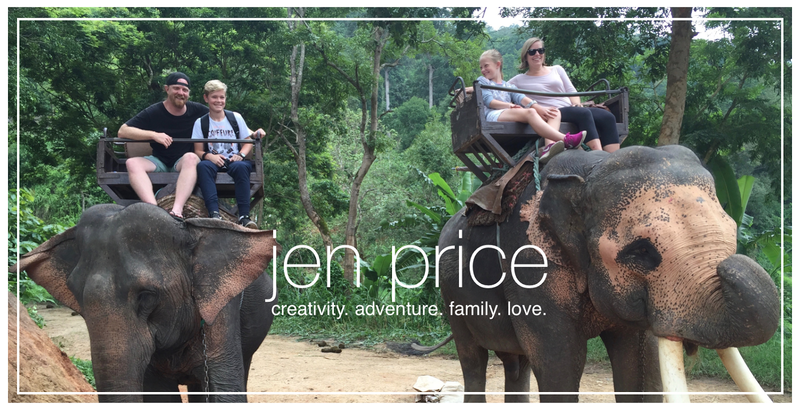 We celebrated Joshua's birthday a little early this year (his actual birthday is April 3rd). It was lots of fun. 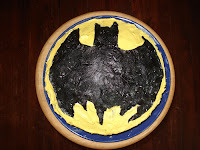 We made a batman symbol birthday cake and all of his friends came. 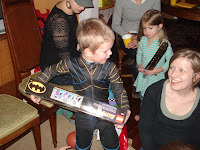 He got Batman legos which was "what I always wanted!" And he got many other cool toys. Thanks to all you guys who came and for all the gifts. He loves all of them and has been sleeping with them every night! Yesterday we had a fun day in Boston! Jeremy's parents came for a visit so we went to Boston for the day. 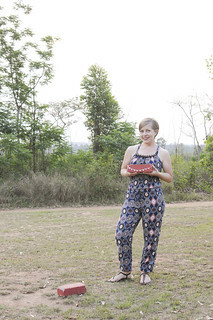 We walked around enjoying a nice, warm day. We saw the harbor, parts of the Freedom Trail, ate authentic Italian food, and even had cannolis from Mike's Pastry Shop. It was fun! Emma Grace does not sit through many movies - except for Shrek. I guess it's because she LOVES princesses! 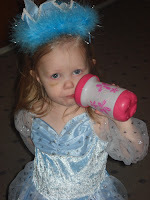 Almost daily she puts on her blue princess dress and informs us that she is Princess Fiona. The other night I had gone down to the basement to get the laundry. When I came up, she was sitting on the stairs and it made me think of the line in Shrek when Princess Fiona says she's been "waiting on a knight so bold as to rescue her..."
While Jeremy has been in S. Africa enjoying sunny, hot weather, we've been here in CT freezing with record lows and below 0 wind chill. And believe me when it's cold you feel it everywhere. These old houses have old windows that leak the cold air. You know it's bad when you hear a gust of air outside and then see the curtains move. I called Jeremy the other day and he was going for a swim in the pool while we were shivering under our duvets and down comforters. Joshua does not like the cold at all. His favorite thing to do on those "too cold for words" days is to haul his pillow and duvet downstairs, plop it down on the floor, and watch a movie. The only thing you can see is his face! Well, our little princess got her second black eye! She got the first one just before Christmas when her eye hit Joshua's head, or maybe the other way around. 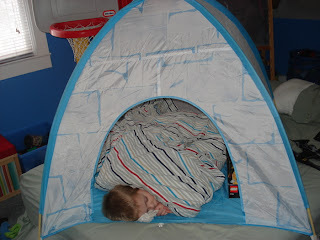 Then the other night we were making a tent in Joshua's room and she tripped and hit the metal bunk bed. Right now it looks like she has green eye shadow on! The first picture is her first black eye and the second one is her current one.